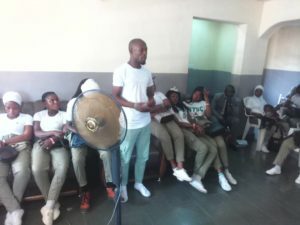 In a show of eagerness to fight corruption in their places of primary assignment, no fewer than 40 members of the Anti-Corruption Community Development Service (CDS) group of the National Youth Service Corps (NYSC), in Olorunda Local Government Area of Osun State recently paid a solidarity visit to the Osun State Office of the Independent Corrupt Practices and Other Related Offences Commission (ICPC) in Osogbo. According to the President of the CDS group, Mr. Samson O. Shaibu, the youth corps- members were on a mission to learn more about the organisation that oversees their group’s activities, and all that it entails to fight corruption. Commending the CDS group for the visit, the Acting State Commissioner, Mr. Baba Alaro Shuaibu said, ICPC’s partnership with NYSC gave birth to the group, which was borne out of the belief that the participation of youths in the anti-corruption campaign would lead to greater success. He noted that, as youths presently serving the nation under the NYSC scheme, the corps-members could use their vibrancy and creativity to educate and enlighten people on the ills of corruption, particularly in their places of primary assignment. Mr. Shuaibu used the opportunity to enlighten the visiting corps-members on important provisions of the Corrupt Practices and Other Related Offences Act 2000, including some of the offences that are punishable under the Act. At the end of the visit, he presented educational materials to the group.